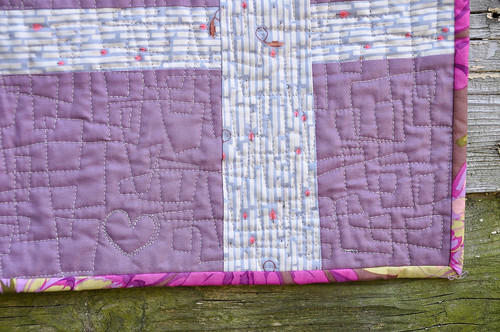 The Wonky Cross is such a fun quilt to make. I started it last year just before Christmas and put the quilt top together in almost one day. I wanted to make a large lap sized quilt and I wanted to use up some of my purple stash that I’d been collecting for a purple quilt. 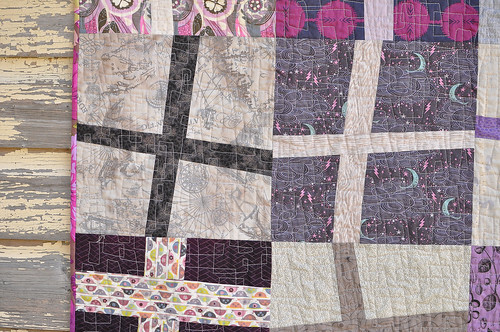 I love every single one of the fabrics in this quilt and it makes me so happy to look at. 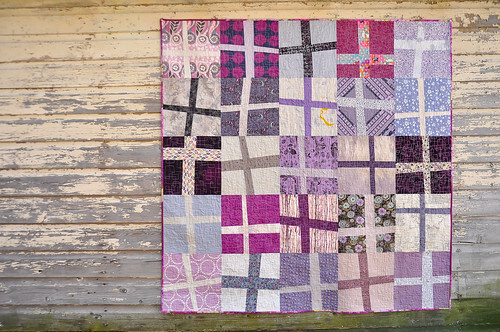 You can find a tutorial for this block done by Elizabeth Hartman here. I made my blocks to finish at 12″ square. The one thing that makes this quilt go nice and fast is to have a square ruler! I used the biggest square I had – 12.5″ square. 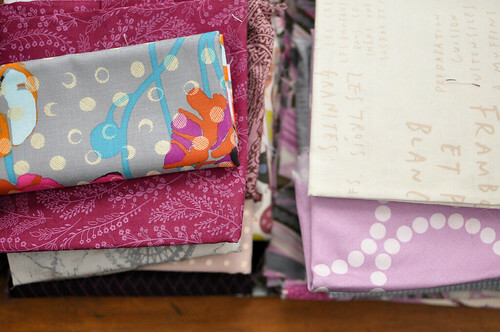 To cut out my initial squares, I just layered 3-4 fat quarters and cut them all at once with the square ruler. Being able to cut out all your quilt pieces in about an hour seems like a miracle to me! I also did a very simple quilt back. Just two fabrics. What took me the longest was the hand embroidered label. My new strategy for quilt labels is to embroider them onto the quilt back before I do the quilting. This way once the quilt is quilted and bound, it is totally done. (Unlike the two finished quilts I have in my closet that need labels so I can give them away) Hopefully my embroidery skills will improve, but I really love the circular shape that I tried out. I’m building up my confidence with free motion quilting. The last quilt I did was a small baby quilt. This quilt is about 50″ x 50″. I am still only comfortable with the same square quilting pattern. Luckily, it works with this quilt pattern. I had to do the quilting in two different sessions and next time I’ll try to get through it in one. The second time I sat down to do it, my style and spacing had changed a bit and it took me a few minutes to warm up to remembering the mechanics of the pattern. This is something no one else will ever notice, but I just thought it was interesting to note. I did end my quilting with a little heart. Eek! Little hidden details like that give me a special thrill. 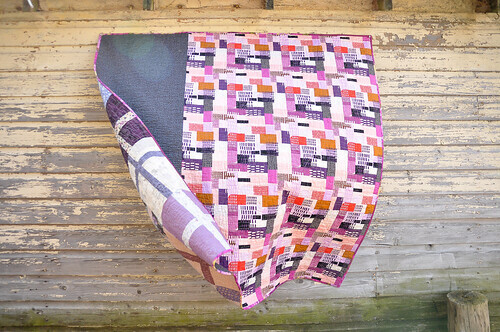 If you need a quick, fun, low pressure, little precision quilt – this is it! 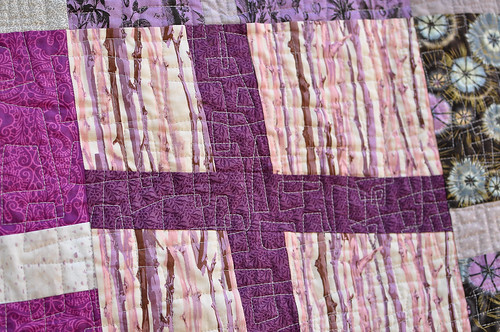 Check out Jacqueline’s Pearl Bracelet Wonky Cross Quilt & Katherine’s Shades of Green Wonky Cross Quilt. Since I finished this quilt top in 2012, it doesn’t count towards my 12 quilt tops in 2013 goal, but I’ve got two quilts in progress to show you next. This is such a beautiful quilt!! I love the hand embroidered label! Maybe one of these days when I feel that confident, I’ll give it a try! 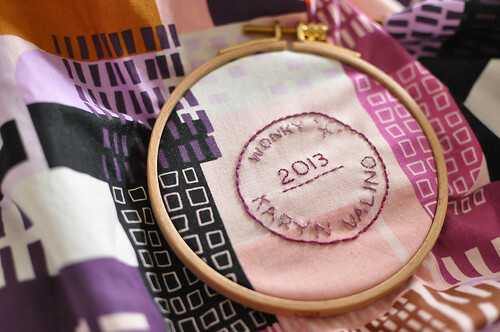 Also, I love, love, love the quilted heart. You’re right, it does add something special! Have a great weekend! I absolutely love this! I’m in love with the little embroidery bit. that is SO pretty karen! absolutely stunning! you have such an eye for color! It’s beautiful Karyn! I really like the colours and values in the fabrics you used. Looks great! My stitch length is not nearly so consistent when I play around with FMQ! this is gorgeous. 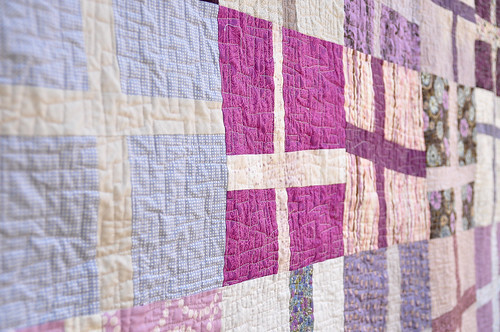 you did a fabulous job with color and quilting. way to go! Love this! 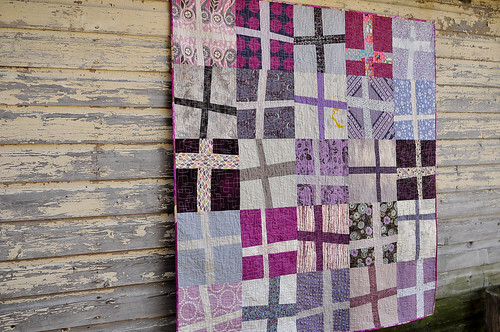 This is the prettiest wonky cross quilt I’ve ever seen. My guild is making one for one of our members who’s having a baby and I’m going to share your version as inspiration! Tara recently posted..Mug Rug Giveaway Winners & a Coupon Code!